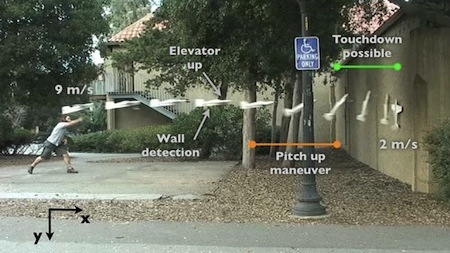 The Perching Project at Stanford seeks to develop a drone that can fly toward a wall, detect the appropriate distance and then put its nose up to land and perch on the wall surface. A flock of small, unmanned air vehicles flies quietly into a city, maneuvering among the buildings. They communicate as they search for places to land, not on streets or flat rooftops but on the sides of buildings and under the eaves, where they can cling, bat or insect-like, in safety and obscurity. Upon identifying landing sites, each flier turns toward a wall, executes an intentional stall and, as it begins to fall, attaches itself using feet equipped with miniature spines that engage small asperities on the surface. Using its propeller in combination with its limbs, the flier can creep along the wall and reorient for a better view. With opposed pairs of spines, the flier clings tenaciously to resist gusts of wind and ride out inclement weather. The fliers stay attached for hours or days, consuming little power and emitting no sound as they monitor the area. When finished, they launch themselves with a jump and become airborne again, ready for their next mission. SF fans from the Golden Age recall a fictional miniature flying machine that can perch and stare - the Scarab Flying Insect Robot from the 1936 story by Raymond Z. Gallun. This project sounds very similar to AeroVironment's Stealthy, Persistent Perch and Stare UAVs From the Perching Project whitepaper (pdf) via News AU; thanks to an anonymous tipster (*Fortigurn) for this story.